Jaw crusher is a kind of mechanical equipment commonly used in ore crushing processing. Unlike the ordinary ore crusher, the crushing force of the jaw crusher can be used for ore with high hardness such as granite, dolomite and calcite. The crusher is generally used for coarse crushing of sand and gravel production lines and has a wide range of applications. We all know that the jaw crusher is always inevitably contaminated with oil and impurities during daily use. These oils and impurities of the jaw crusher are generally made of non-saponifiable oil and dust, and these impurities are also different. Therefore, it is necessary to choose a suitable cleaning solution and then to clean the jaw crusher. 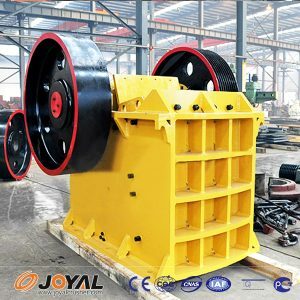 Shanghai Joyal Mining Machinery here and everyone talk about the correct cleaning method of the jaw crusher. The user can place the jaw crusher parts in a container with diesel, kerosene or other cleaning fluid, scrub with cotton yarn or brush with a brush. This method is easy to operate, simple in equipment, but low in efficiency, and is suitable for small parts and small parts. Joyal reminds everyone to pay attention to clean up the jaw type. Under normal circumstances, it is not suitable to use gasoline. Because gasoline is fat-soluble, it will damage people’s health and cause fire. The user can also put the configured solution together with the parts of the jaw crusher to be cleaned in a properly sized cleaning tank welded with steel plates, and heat it to 80 ° C-90 with a stove under the pool; it will have a certain pressure The temperature of the cleaning liquid is sprayed onto the surface of the jaw crusher to clean the oil. What are the parts of the mobile crusher?